Another of my favorite coastal villages is Lossiemouth, or just Lossie as the locals say. It is known as the jewel of the Moray Firth. It has also become a favorite of my family and as a srop while on tour with our group tours. The town began as a port at the mouth of the River Lossie to help the town of Elgin in trading. The port is now a busy town itself and a marina has developed in the twin basined harbour. The first time I was in Lossie, it was a cold brisk March day, but I was immediately enchanted anyway. The area is generally favored by a Gulf Stream that provides for quite mild days but today it was not apparent. Upon arriving from Elgin, our first sight was the wee main street of Lossie that soon gives way to the harbour where we first caught a glimpse of the brilliant white sandy beaches that stretch for miles east and west of town. Further on we saw the spectacular yachting marina and a resident fishing fleet where fishermen continue to bring in their daily catches to the fish market. 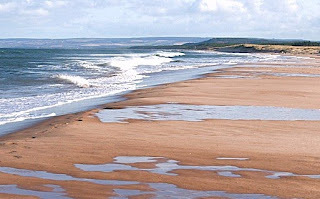 To the west, this splendid beachfront stretches for 3 miles, while to the east, this beach characterised by its sand dunes which run parallel to the sea and the river, stretches even further. It is reached by a wooden pedestrian bridge over the river Lossie. The bridge was built originally to encourage day trippers on the old Moray Railway to visit the town in the summer months, as there was once a railway between Elgin and Lossie. The dunes on the beach were made from old railway carriages to protect the seatown from heavy seas. The second time I was in Lossie was with a group I was leading. Again, it was a cool crisp day but in September this time around. As we crossed the bridge to the beach, one of the ladies on the tour kicked of her shoes and raced in to the firth! I was chilled to the bone just watching her, but it was her first sight of Atlantic waters and she was not going to let the moment pass! The sun was out and dogs were racing up and down the beach while the kite fliers and windsurfers were having the time of their lives! The third time I was in Lossie, it was a glorious summer day. The sky and the sea were in competition to see who could outshine the other. We were on tour and we had 2 delightful elderly ladies with us. Their names were MaryLou and Yolanda but had become YoYo and LuLu! I had sat with them on a bench overlooking the beach while we had an ice cream. They said it was the perfect place sit because they had a good view of all the eligible men coming from both directions down the beach. They later on decided to write about their exploits while on tour and call it "YoYo and LuLu do Scotland". We had so much fun with them! There is a lovely bakery in Lossie, a few pubs along with a couple of other good eateries, a fisheries museum, a library and a smattering of other local shops. There are many trails and designated paths so you can enjoy coastal or countryside outings and you can take sea excursions to see dolphins and seals. I have learned over the years, that no matter the weather, Lossie is a perfect little spot to spend an hour, an afternoon or the whole day.